Jump to a list of all Austrian castle hotels here or click on a region. Haven’t decided on a hotel yet? You can look at other available hotels in Austria with Booking.com. Castle hotels (Schlosshotels) in Austria overflow with charm and personality. Choices abound from magnificent stone fortresses high on a hilltop, baroque palaces filled with antiques, to lakeside manors and hunting lodges that give a first-hand look into a gracious past. Often you’ll find hotels that have been run by the same family (sometimes titled) for generations. What can I expect at an Austrian castle hotel? Is it possible to get married in an Austrian castle hotel? When is the best time to travel to Austria? I don’t speak German! How will I communicate? Every region of Austria is stunning! 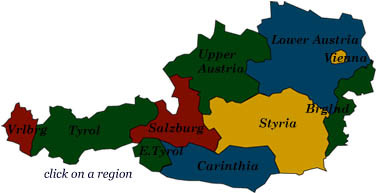 Styria and Burgenland: mountains and forests give way to vineyards and orchards overseen by hilltop fortresses.